Silverthorne Town Hall is located at 601 Center Circle, Silverthorne, CO 80498; phone: 970-262-7300. 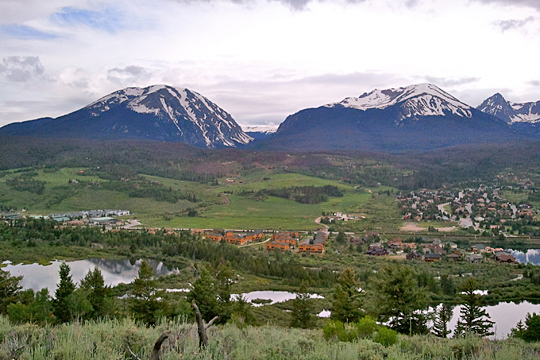 Photo: A view of Silverthorne, Colorado, from atop a nearby mountain. Photographed by User:Av9 (own work), 2011, [cc0-by-1.0 (creativecommons.org/publicdomain/zero/1.0/deed.en], via Wikimedia Commons, accessed October, 2012. Incorporated as a Town since 1967, Silverthorne has a rich past rooted in the area's development history. Credit for establishing the future Town site has to go to one of the more colorful characters in the history of Summit County, Judge Marshall Silverthorn. Known by most as "Judge" for his appointment as judge of the Miner's Court in Breckenridge, Silverthorn came to Breckenridge in 1859 to regain his health and ended up staying long enough to build and operate the Silverthorn Hotel and, at the same time, provide many important services to the young Town. According to the Breckenridge Journal, "At times, in the early days, he was the principal, and sometimes the only, business man in camp. He was storekeeper, postmaster, justice of the peace, blacksmith and landlord by turns or all combined." Silverthorn also had a penchant for mining and its associated spoils. That is why he and his colleagues purchased 160 acres from the US Government on January 18, 1881, in the area between the Blue River and the Blue River Parkway in present day Silverthorne. Having visions of great wealth in the gold that was in the area, Judge Silverthorn purchased the 7/8 interest from his friends and was the sole owner of the property when he applied for a Mining Patent for what became known as the Silverthorn Placer on April 15, 1882. Unfortunately, not much wealth, if any, was ever taken from the site and upon Silverthorn's death in 1887, the Silverthorn Placer was given to his daughters. There wasn't much activity on the land in the ensuing years. The "e" was added to end of the name Silverthorn in the 1930's when it was considered fashionable to have names end in "e."
Various mining companies owned the land until 1953, when it and several other placer mines, including the Willow Creek and Arctic Placer, were purchased from Harry Baron for $18,500 by a man named Clayton Hill. Hill was responsible for subdividing what are now the Buffalo and Silverthorn Subdivisions as well as the Silverthorne Colorado Subdivision on January 5, 1956. In 1957, Myrth and Robert Z. Roush subdivided Ptarmigan Trail Estates, Units I, II, and III. These subdivisions were home to the construction workers building the Dillon Dam, which began in the late 1950's and was officially completed on December 17, 1963. When Silverthorne became an incorporated Town on September 5, 1967, it consisted of approximately 400 acres and by 1970 boasted a population of 400. Of all the Towns in the State of Colorado, few have experienced the overwhelming change that Silverthorne has in the short time since its incorporation in 1967. Over the course of its existence, the Town of Silverthorne has gone from a makeshift construction camp for workers building the Dillon Dam, to a period where the most the Town had to offer was a convenient refueling stop along the Interstate, to a full-service, well-balanced community of an estimated 4,061 people. Located near a number of world-class resorts, Silverthorne offers a wide array of facilities. Amenities include the Silverthorne Recreation Center; the Outlets at Silverthorne; and Gold Medal Fishing on the Blue River which has helped Silverthorne firmly establish itself as a destination in its own right. Today, the evolution of the Town continues, as plans for the future of the Town are underway. In all likelihood, there will be as much change in the upcoming years as there has been in the past. The Town of Silverthorne is located in the Colorado Rocky Mountains, approximately 70 miles west of Denver at an elevation of 8,730 feet (a little more than 1-1/2 miles above sea level). It is situated along the Lower Blue River Valley below peaks of 12,000 and 13,000 feet, and is surrounded on two sides by national forest and Wilderness Areas. The Town is considered by many to be the gateway not only to Summit County, but also to much of Western Colorado, due largely to its excellent location as the first exit west of the Eisenhower Tunnel along I-70, at the intersection of Highway 9 and Highway 6. The Denver International Airport is roughly 100 miles from Silverthorne, approximately a two-hour drive. There are five ski areas within a half-hour drive from the Town Breckenridge, Copper Mountain, Keystone, Arapahoe Basin and Loveland — and a few others, including Vail and Beaver Creek, less than an hour away. Town of Silverthorne, Community Development Department, 2010 Community Profile, www.silverthorne.org, accessed October, 2012.